The background is an encaustic collage of a photograph of a San Juan Islands madrona tree trunk with its characteristic peeling bark. It is mounted on a pieces of a window frame from a torn-down farmhouse near Moscow, ID. 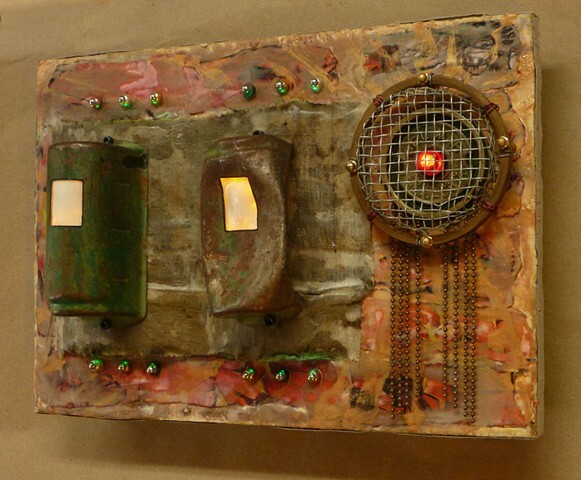 A canvas rag, soaked in wax and molded over cardboard cylinder sections covers an LED light that reflects on the metal beads attached above and below. The green equipment covers were cut using a laser guide to keep the holes square on an uneven surface. The brass piece holding the red light assembly is a commercial sprinkler head. Long-life (25,000+ hours) LEDs illuminate the green covers and the red indicator lens in the sprinkler head. The essence of this piece came together quickly in an unusually emphatic, purposeful effort. Then it approached the finish very slowly and deliberately. To me this piece has a very special presence.